This product is available in eBay, Amazon.in, Flipkart. At ebay.in you can purchase Lenovo K8 Plus Fine Gold 32GB 4GB 4G-Certified Refurbished-Good Condition for only Rs. 8,273, which is 31% less than the cost in Flipkart (Rs. 11,999). 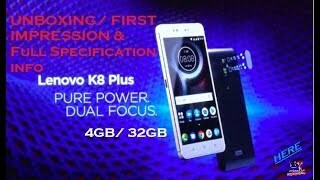 The lowest price of Lenovo K8 Plus (Venom Black, 32 GB)(4 GB RAM) was obtained on April 18, 2019 4:08 pm. Bring the new Lenovo K8 PLUS that comes with 5.2 inches display and with the resolution of 720X1280Pixels. Lenovo K8 PLUS designed with octa-core MediaTek Helio P20 processor. With its 3GB of RAM and processor, the device shows its powerful performance. The LENOVO K8 implicated with a 13-megapixel primary camera and an 8-megapixel front camera for selfies. To save your memories that are captured the device provided with 32 GB memory that can be expandable to 128GB with microSD card. The device runs on Android 7.1.1 and provided with a 4000mAh battery that is non-removable. It weighs 165.00 grams. Due to its light weight, it is easy to use. The LENOVO K8 contains dual sim slots that acknowledge Nano-SIM and Nano-SIM. It comes equipped with Wi-Fi, GPS, Bluetooth, USB OTG, FM, 3G and 4G .